An analysis of the current wave of state repression of the Anarcho-Syndicalist Initiative. Since the official forming of our organisation in late 2002, not a single year has passed without our activists being arrested or legally prosecuted. It is important to note that all of them have been acquitted. Currently, there are legal proceedings against seven members of our Belgrade local group for various offenses. This kind of repression against our organisation is a clear sign of weakness of an inhuman system on the wane. In the days immediately following the NATO conference in Belgrade and the arrests of our members who participated in the Anti-NATO campaign, the staged proceedings against members of the Anarcho-Syndicalist Initiative (ASI), which had ended more than a year ago with acquittal, have magically been revived. According to the decision of the Belgrade Court of Appeals (which was admitted at the Belgrade High Court on the 24th of June 2011), the appeal of the Public Prosecutor in Belgrade was granted and the acquittal of "The Belgrade Six" (passed on 16th June 2010) was overturned. The case has been returned to the Court of First Instance for retrial. Only a few days later, on 29th June 2011, the High Court in Belgrade (under judge Dragomir Gerasimović, who passed the verdict of acquittal of "The Belgrade Six"), announced that his court has no jurisdiction to act in proceedings against the Six, and decided to submit the case to the Court of First Instance in Belgrade. This, politically motivated decision of the Court of Appeals is accompanied with legally and in every other way illiterate explanation which is not placing forward any argument to support that verdict, and is only once again reaffirming political character of the whole case against the Six. 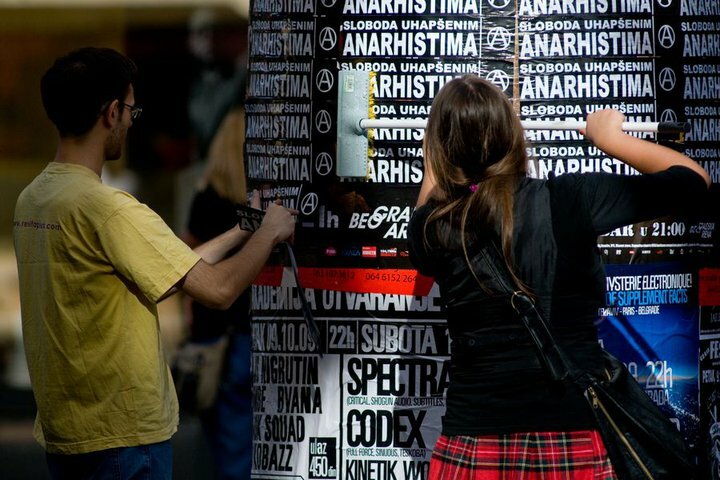 We remind the public that in September 2009 in Belgrade, Serbia, four members of ASI were arrested together with two other unaffiliated Belgrade anarchists (Sanja Dojkić, Ivan Vulović, Ratibor Trivunac, Tadej Kurepa, Ivan Savić and Nikola Mitrović), under charges of attacking the Greek Embassy in Belgrade. Namely, in the night between 24th and 25th Of August 2009, two bottles of a flammable liquid hit the pavement near the embassy, and an encircled letter "A" (a symbol of the anarchist movement) was drawn on the facade. The damage was estimated at 18 Euros. This event, which was characterised by the police as the criminal offense of "causing general public danger", was revised after an intervention from "on high" within the Serbian state. The result was the first indictment for "international terrorism" in Serbian history. One of the key reasons for these charges was the fact that ASI was at the time delegated to perform the duties of the Secretariat of the International Workers' Association, thus contributing to the international co-ordination, not of "terrorists", but of fighting union organisations from around the world. Despite the fact that the case is evidently framed and based on political pressure, throughout the investigation, which was conducted by Judge Milan Dilparić, (in charge of the most important political cases, such as the cases of Radovan Karadžić and Ratko Mladić) such absurd charges were upheld. It is important to stress that the Six were suspected of having organized the attack as members of ASI. This underlines the desire of the state to criminalize our organization, and accuse it of participating and organising international terrorist attacks – which is clear from the allegations of existence of some sort of "Greek association named 'ASI'," which of course never existed. The reaction to the arrogance and open state repression, made evident in the faking of evidence against the Six and the mindless qualification of this event as international terrorism, served as the basis for mobilizing public opinion against this trial, which was immediately – correctly - identified as a staged political process against critics of the regime. During the period the Six spent in custody, the public, both in Serbia and the region, and in the world, reacted strongly against such conduct of the Serbian authorities. The interest sparked by the case and the resulting public pressure undoubtedly played a crucial role in the release of the Belgrade Six which enabled them to mount their defense outside prison, and played a crucial role in their acquittal. The senior public prosecutor filed an appeal against the acquittal on the same day and during the following year there were no further news on the case. We have recognized this silence as another method of repression against our organization, and our expectations that the case will be revived when those in power feel the need to increase pressure on ASI, have proved accurate. It should be noted that even after the acquittal of the Belgrade Six and until the restarting of the proceedings, ASI was subjected to continuous political-legal and physical pressures of the state and its fascist para-police groups. Comrade Davor Bilić from Croatia, who came to support the Six during the trial was prevented from leaving Belgrade for more than seven months. Davor, and three members of ASI from Vršac (who a few months earlier expressed public solidarity with the six, also well within legal bounds) faced charges for "obstruction of justice”. All were ultimately acquitted, after long and exhausting legal processes. At the same time, police-controlled fascist groups organized physical attacks on members of ASI, and distributed leaflets and posters with photos and addresses of members and friends of ASI. Likewise, in February 2011, staged proceedings were initiated against the General Secretary of ASI, Milan Stojanović in re-instituted legal proceedings. In a case dating from 2006, Milan was mysteriously transformed from a witness of the offense of "unauthorized use of another person’s vehicle, through breaking in or using threatening language," into a suspect. The offense carries a penalty of up to 5 years of imprisonement. The request for the registration of ASI in the Serbian Union Register was, again, filed on the 29th June 2010. Even though the legal deadline for responding is 15 working days, we have been waiting for it for over a year. Likewise, all possible legal provisions were utilized to block and hinder the work of the registered legal publishing and research body of ASI, The Centre for Libertarian Studies, which forms part of the International Federation of Centers for Libertarian Studies and Documentation. Despite the repression, ASI has continued, within its resources, the struggle against capitalism and the state. Antimilitarism has always been one of the cornerstones of the revolutionary workers' movement and the revolutionary syndicalists have historically been the brightest examples of struggle against barbaric state crimes embodied in bourgeois wars. In light of this, there is nothing unusual in the fact that ASI launched an Anti-NATO campaign (http://antinato.in.rs/) in April 2011 in response to the scheduled NATO gathering between 13th and 15th June in Belgrade. According to official information coming from NATO, the gathering was "a key activity within the campaign of strategic action of the Supreme Allied Command Transformation (SACT)" and the biggest gathering in NATO's history. Although it was ASI that launched the campaign, our intention from the beginning was that the campaign quickly outgrows our organisation, which it did. The Anti-NATO campaign became an independent popular platform, based on the principles of direct democracy and direct action. It was a gathering of all those with a progressive position engaged in the struggle against militarism and the crimes of NATO, clearly distancing itself from the chauvinistic and isolationist critics of the military alliance. Soon after public work on the Anti-NATO campaign started in early May, it became apparent that the Serbian bourgeoisie, will act as a compradore in mounting a concerted effort to hinder and prevent our actions in a brutal way. It became clear that NATO, as one of the key instruments of global capitalist imperialist oppression and exploitation, can in Serbia fully count on the support of the primitive, but sufficiently effective repressive apparatus of the state. Activists of the Anti-NATO campaign were under constant police pressure: they were detained for no reason and summoned to formal and informal interviews, during which they were threatened with mass arrests. The police deliberately removed posters of the campaign which were displayed in places designated for public advertising. The bourgeois media and news agencies refused to in any way mention the NATO rally or provide information to the broader public, completely hiding the fact that such an event will take place in Belgrade. The high level of repression led to the decision to cancel the organization of the planned international camp that was to be organized for and by antimilitarist activists from around the world. Despite such pressure, the Anti-NATO campaign managed to mobilize a number of activists, to inform the public to some extent and was involved in articulating criticism of the NATO gathering, which was later accepted by other political subjects in Serbia. The Anti-NATO campaign decided to hold on the 12th of June, the first of several planned, publicly announced protests against the NATO gathering in front of the "Sava Centre" in Belgrade. Coincidentally, that day at the Sava Centre, the main board meeting of the Democratic Party (Serbia's ruling party) was taking place, whose member also is the Minister of Defence Dragan Šutanovac, one of the top operatives of NATO in Serbia and the formal host of this gathering of war criminals from around the world. The media and nationalist opposition parties, as an alternative acceptable to the system, united forces a few days before the gathering in order to reduce the effect of the Anti-NATO campaign. The Democratic Party of Serbia (DSS) of the former Prime Minister Vojislav Koštunica, (whose representatives, during their period in office, participated in various phases of rapprochement between Serbia and NATO), two days before the announced protest of the Anti-NATO campaign, called for a protest to coincide with it at the other end of town. The media then used this fact to reinforce the false opposition between a liberal pro-NATO position and a nationalist one (by, nominally, anti-NATO parties), hindering the articulation of a progressive left-wing anti-NATO position. Paid DSS activists worked very hard to plaster the city with their own posters obliterating the posters of the Anti-NATO campaign. The DSS's protest passed with full media coverage, rallying less than 500 people, while the most visible part of the protest were members of the clerofascist group "Obraz" who paraded with Nazi posters from World War II. It is interesting that uniformed police presence at this protest was minimal, and that the activists of the police-controlled fascist organization disbanded after their gathering and prevented any outbreaks. On the other hand, at the peaceful protest of the Anti-NATO campaign, which was kettled by police as soon as approximately one hundred people gathered, the demonstrators were insulted and shoved down the surrounding slopes. Unidentified plainclothes policemen brutally arrested eight participants, of which three are members of ASI. The six arrested, including a Croatian citizen Nikola Vukobratović, were taken to the New Belgrade police station, where they were held in custody for 48 hours. The remaining two were taken to the 29th November Street police station. One was soon released, and the other, Ratibor Trivunac, was speedily sentenced to 15 days in jail and immediately sent to serve his term in Padinska Skela prison. Criminal proceedings were initiated against Trivunac and the six incarcerated in New Belgrade police station, for the "obstruction of official persons in performing their duties". Kosta Ristić, a member of ASI, is facing charges for "assaulting an officer on duty", although events captured on video clearly show that his arrest was the most brutal one. We should point out that the legal proceedings under judge Goran Milutinović are completely framed and unfounded, even under bourgeois law. It is important to point out that Milutinović is the same judge who convicted Trivunac to ten days imprisonment in May 2009, for the public burning of the flag of the United States of America during the visit of U.S. Vice President Joseph Biden to Serbia. Although the protest against the NATO gathering was announced and organized by the Anti-NATO campaign, Trivunac was charged with organizing the protest "as an activist of the Anarcho-Syndicalist Initiative“, and that during his participation in the protest committed the misdemeanor of "disturbing public order and peace''. "Evidence" for these allegations are found in the false testimonies of police officers of the Department of Public Order of the Belgrade City Police, Dejan Vasić and Saša Todorović, the latter who testified against Trivunac while visibly intoxicated by alcohol. This protest and the repression against its participants, not only demonstrates the continued repression carried out against the revolutionary movement in Serbia by the Serbian government, but it also raises questions about important issues for which battles are yet to be fought: the right of citizens to free assembly, the preventing of undercover police to infiltrate into these gatherings and act without identification, etc. Trivunac's appeal was rejected on the 20th of June accompanied by an unsatisfactory legal justification of the Belgrade Court of High Misdemeanors, and he served his sentence of 15 days. Further criminal proceedings against those arrested at the protest are yet to begin. Immediately after the breaking up of the protest and the arrests, certain sections of the bourgeois media, supported by government experts, commenced a media lynch of ASI and its members. The attack was spearheaded by the tabloid Blic (largest Serbian daily newspaper), an informal newsletter of the ruling parties, which attacked ASI in two articles, "Leader of the Serbian anarchists behind bars" (15-06-11) and "The brotherly ties of anarchists in the Balkans" (17-06-11). These articles clearly demonstrated what police-commissioned articles look like. The text is written by the "journalist" Vuk Z. Cvijić, who was earlier publicly identified as an associate of the Serbian military intelligence. The first, shorter text, besides the meaningless title that refers to Trivunac as the "leader" of Serbian anarchists, spends three quarters of its word count "reminding" the public about the case of the Greek Embassy and the ominous prediction of the impending decision of Appeal Court. The second, longer text is almost entirely assembled from extracts from half-literate and factually incorrect articles that have been published in local newspapers over the past few years. This article, a journalistic Frankenstein in which the co-operation and links between anarchosyndicalists from Serbia, Croatia and the region are described from chauvinist positions, was featured on the front page of Blic. In its conclusion, the text repeats a call to the Court of Appeals to overturn the acquittal of the Belgrade Six. Attacks on ASI did not only come from the pen of the regime's journalists: Jovica Trkulja, a professor of the Faculty of Law in Belgrade, as a "representative of qualified public" at a public hearing in the Constitutional Court regarding a ban of right-wing organizations on 22nd June 2011, classified "anarcho-syndicate" alongside the clero-fascist organization "Obraz", under the worn platitude of "extremist groups". Just days after the release of Ratibor Trivunac, the Belgrade Six and their legal representatives found out from the media that what was announced in the police articles in "Blic" has now come about and that their acquittal has been overturned. We have no intention to seek pity or bemoan the situation in which our organization finds itself. From the first day of our activities, aware of the task we have put before our organization, we were ready for drastic repression. The aim of this text is to inform the domestic and foreign public of the models of repression carried out against the libertarian movement by the Serbian state. It is also an announcement to those who carry out this repression, and to the entire working class and all the exploited that we will not be intimidated or stopped. The Anarcho-Syndicalist Initiative, together with our International, The International Workers' Association (AIT-IWA), as well as the global libertarian and revolutionary movement, are carefully following the continued legal repression and repression by any other means of our members. Accordingly, we inform the authorities that, in case of further repression, we will restart the campaign in Serbia and worldwide, against the persecution of our activists and our organization. We demand the suspension of all staged trials, against the members of the Anarcho-Syndicalist Initiative! We demand a stop to the repression against the syndicalist movement in Serbia! Look forward to hearing about any UK actions in support of the ASI persecution.